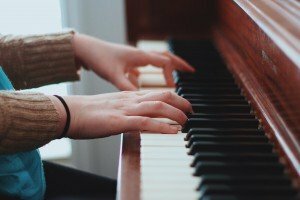 Science just discovered something amazing about what childhood piano lessons did to you! If your parents forced you to practice your scales by saying it would “build character,” they were onto something. The Washington Post reports that one of the largest scientific studies into music’s effect on the brain has found something striking: Musical training doesn’t just affect your musical ability — it provides tremendous benefits to children’s emotional and behavioral maturation. The study by the University of Vermont College of Medicine found that even those who never made it past nursery rhyme songs and do-re-mi’s likely received some major developmental benefits just from playing. The study provides even more evidence as to why providing children with high-quality music education may be one of the most effective ways to ensure their success in life. The study: James Hudziak and his colleagues analyzed the brain scans of 232 children ages 6 to 18, looking for relationships between cortical thickness and musical training. Previous studies the team had performed revealed that anxiety, depression, attention problems and aggression correspond with changes to cortical thickness. Hudziak and his team sought to discover whether a “positive activity” like musical training could affect the opposite changes in young minds. We need this sort of proof now more than ever. In presenting their findings, the authors reveal a terrifying truth about the American education system: Three-quarters of high school students “rarely or never” receive extracurricular lessons in the music or the arts. And that’s depriving kids of way more than just knowing an instrument. School systems that don’t dedicate adequate time and resources to musical training are robbing their kids of so much. Prior research proves that learning music can help children develop spatiotemporal faculties, which then aid their ability to solve complex math. It can also help children improve their reading comprehension and verbal abilities, especially for those who speak English as a second language. In these ways music can be a powerful tool in helping to close the achievement gaps that have plagued American schools for so long. It’s even been shown that children who receive musical training in school also tend to be more civically engaged and maintain higher grade-point averages than children who don’t. In short, musical education can address many of the systemic problems in American education. Hudziak’s research is an important addition to the field because it shows that music helps us become better people, too. One thing is clear: Learning music is one of the best things a person can do. Who knows — running scales may have changed your life. And it could change the lives of future generations too. Refer a friend and you both earn $32 toward classes! How to Choose the Correct Violin Size?